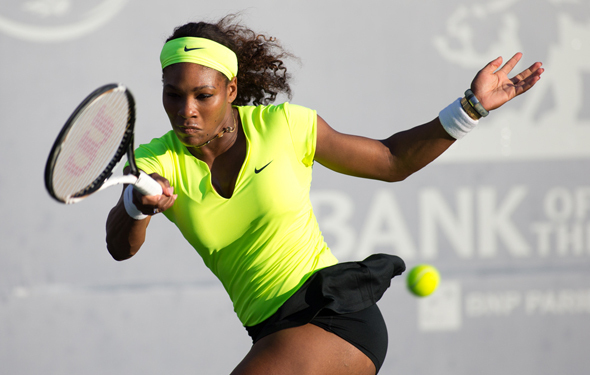 Serena appears to be nearly unstoppable. ISTANBUL — The first day of the TEB BNP Paribas WTA Championships at the Sinan Erdem dome started with a whale of a first set between Victoria Azarenka and Sara Errani, with the smaller but quicker Italian throwing up one eye-popping lob winner after another to gain an early lead. But two-time Aussie Open champion Azarenka was clearly rusty and even though she fell behind 5-2, she stuck with her game plan of being patient until she had ball she could wallop. What was lacking for a while was execution, but then her groundstrokes inched loser to the lines, she began to read the Italian when she was attempting to draw her in with soft drop shots, and she hit her spots with her serve more accurately. Azarenka wiped off the rust cleanly, played a headier tiebreaker and then raced way as Errani unusually began to cramp.A 7-6 (7) 6-2 victory for the Belarussian was in her pocket and the favorite in the White Group was feeling a whole lot better about herself than she did when she landed in Istanbul. Recall that after the US Open, she traveled to Asia, caught a virus and did nothing in Tokyo and Beijing. That was on her. Next up was the heavy favorite of the tournament, Serena Williams, who absolutely wiped the court with Angelique Kerber 6-3 6-1. Kerber said that she had no chance in the match as Serena served and returned “unbelievably.” Peter Bodo of TENNIS.com thought the German tanked the second set. Petra Kvitova and Aga Radwanska ended the session, which was fairly full attendance-wise.You can read my reaction to Kvitova’s win here , but it’s also important to note that Radwanska showed up in her press conference looking like she had cried in the locker room. She has to face Serena on Wednesday night , whom she is 0-7 against and doesn’t feel like she has a much of chance to upset the American. She recently joked that maybe she should try playing Williams left-handed. Maybe she should attempt to tie Serena’s left arm and left foot together and see if she can beat her while she’s falling over. The other Wednesday matches are Errani versus Li Na (Red Group) and Azarenka versus Jelena Jankovic (White Group) Here is Jankovic discussing her long road back to the top 10. Here is why Errani won’t defend her Acapulco title. Here is my update on the Russian Fed Cup drama, where captain Shamil Tarpischev can’t seem to find one top 100 player to compete with him. Three of his top players will compete in Sofia instead. I will head to Sardinia for the fed Cup final next week. Stan Wawrinka took a big loss in Basel but can still qualify for the ATP World Finals. Tom Berdych also lost, but he should make it to London anyway. The Masters event in Paris/Bercy will be huge this year. Roger Federer did score a win and passed his buddy Stan in the points race. Azarenka says that she would rather see the men reduce to two out of three sets at the Slams than the women play three out of five. Prince and Babolat have both introduced new racquet collections.